Pics of my sailing setup thus far - criticism/tips/derision welcome! Thread: Pics of my sailing setup thus far - criticism/tips/derision welcome! Thought I'd post a few pics of how far I've got with converting the trusty OT Disco 158 for sailing. Been out on her a couple of times now and pleased with my efforts but I would welcome any input from those more proficient at sailing than me (all of you basically). 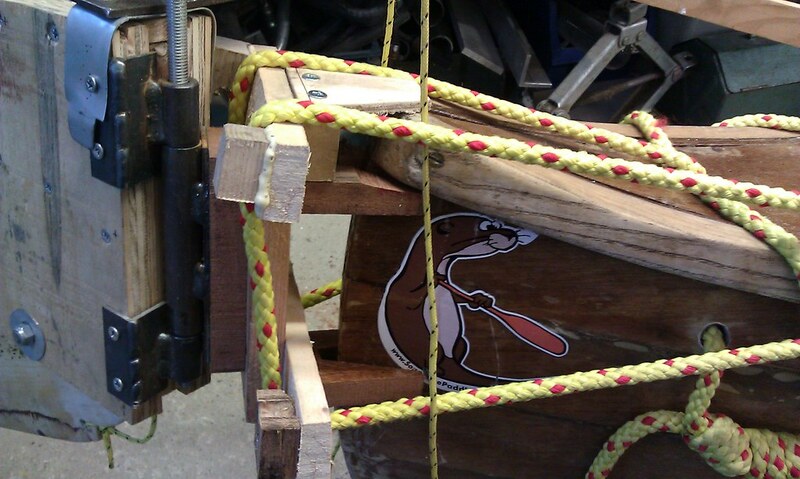 Still on the to do list is to make some outriggers, and make new lee boards and rudder with aerofoil section. 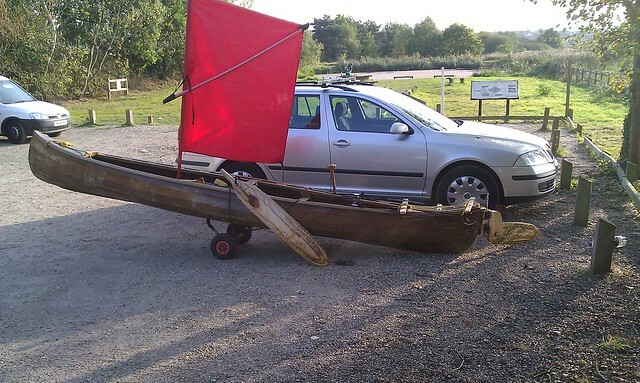 Its all been done on a very limited budget - under £300 for the whole thing including the canoe - so she may not be pretty but I've been able to get on the water despite tough times. Lee board thwart clamps using pushbike wheel cam levers. Metal angle screwed and G-flexed to thwart. I strap a barrel fore and aft for extra buoyancy, side bags are dry bags with inflated thermarests in! 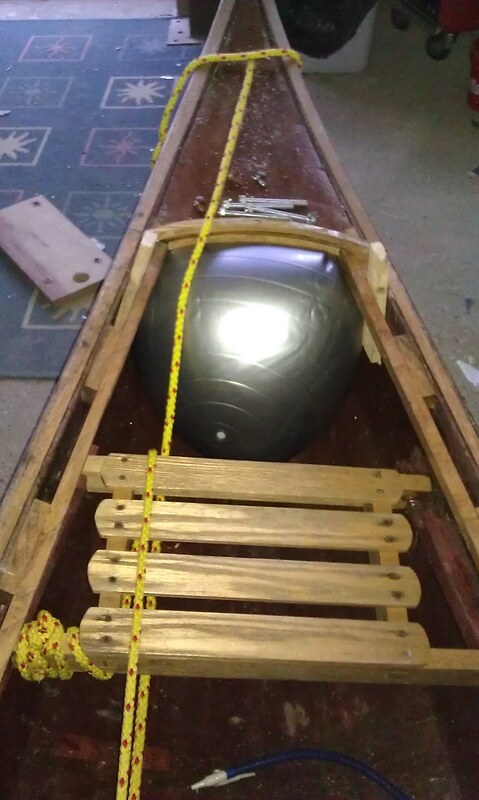 A bit heath robinson, but it is very floaty after capsize. Last but not least, my most essential upgrade is a rope stirrup attached to rear/kneeling thwart for post capsize recovery. Will do one on each side out of floating rope before next session. really works well - boat just flips upright and in you get. Last edited by fredster; 5th-October-2011 at 05:12 PM. That mast thwart/foot looks excellent Fredster, very substantial. Ingenious side airbags too, I like it. You may find that your leeboard mount needs reinforcing as you get out in stronger winds, there's a huge amount of pressure on them. Gailainne had one on his canoe that he thought was plenty strong enough and it bent like plasticine! The "more knowledgeable section" will no doubt be along soon to cast an expert eye over it but I reckon it all looks pretty good, well done. It really does look good - and all for ~£300? Amazing! I definitely know less about sailing than you but with that sail I wouldn't want to be in anything faster than a force 2-3 before getting the outriggers fitted. Mind you, going with the wind I'm sure you'll have one of the fastest canoes out there. Great job. Your leeboard bracket will definitely not be strong enough as you get more proficient and sail in stronger wind. The ones that we use are 3 1/2 inch by 3 1/2inch by 3/8 inch thick. We tried 1/4inch thick to start with and managed to bend them. How thick can I get away with using Ally? I seem to be doing things the other way around to fred. I can't afford the sail yet, so I'm just making bits to go on the boat first. Couple of weeks back I made a pair of out riggers, which may have been a tad too small. But good prototypes, just need to be twice as big. Last edited by joe.ford; 5th-October-2011 at 08:02 PM. Is that in ally Dave or steel? Mine are steel, 4mm thick and boards (there will be two eventually) are 3 foot long. I must admit to having a suspicion that my brackets would be weak spot and wondered about using a hardwood block at each end of thwart, say, 3" cubed to take the load a bit better? Failing that I can fabricate chunkier metal brackets as I have a welder. Arf! Nothing worse than being camped miles from home, running out of gas and not being able to boil a kettle. I simply won't risk missing my morning cuppa. Last edited by fredster; 5th-October-2011 at 09:23 PM. Thanks for posting some pics of your rig. I see what you mean, a lot of similarities with my own. Your clip-on rudder assembly looks tiny compared to mine, but then you have drilled 3-holes in your canoe to mount it, albeit just under the gunwales! As others have said, your mast thwart & foot looks great. A nice job and looks really fit for purpose. I would agree that the weakness in your rig is the leeboard mount. Only last weekend did I hit the concrete slipway with my leeboard as I sailed a bit too close to it and watched how my leeboard thwart tried to twist itself off the canoe for that split second. Luckily nothing broke, but the forces involved were pretty big. Half an hour later, I noticed that the club had put a few more buoys out to warn people of the slipway and the lowish water line!!! If you make a stronger, thicker bracket, I would also be tempted to make the bracket slightly bigger so that it has greater surface contact with the leeboard and the thwart to spread the forces out a little more. As you say, if you are fitting two leeboards, one on each side and they are much shorter that the SD leeboards, you might be okay as the leverage on each bracket will be smaller. In addition to this, should a bracket fail while sailing hard, you still have another leeboard to save your bacon. I might be tempted to fit the other leeboard and see how you get on! As for outriggers, I am trying not to go down that route if I can help it. As my experience at sailing my canoe grows, I feel that I can handle stronger & stronger winds and find myself looking upwind at other boats or at the surface of the water for the next big gust, but then I do most of my sailing on inland lakes and might feel differently if I was in the sea or on a large expanse of water. I am also picky and am avoiding F5+ winds at the moment. We were messing about with rope stirrups last weekend. Have you tried yours and found them to be the right length? We found that the toe loops needed to be much higher than yours seem to be. Almost a foot higher in fact because as you push down on them, they push away under the canoe towards the other side! It all looks good though, well done. I don't think people know just how much work goes into converting these canoes into sailing canoes, until they have done it themselves. Give me a shout if you are testing it out in these parts sometime and I'll try to join you. Cheers for comments and tips Chris - rudder mount looks a bit sketchy I know but it feels rock solid. I put a fair amount of force on it when testing it and it didn't budge an inch. Obviously the true test will be some strong wind - will report back if it it fails at all. I will be improving the lee board bracket. For now I'll just weld a larger bracket and put some strengthening on it, but to be honest its early days and I'm only going out in light winds. Like you say with two smaller lee boards the stress to thwarts and brackets is reduced somewhat compared to a larger board, but obviously everything on boat has to be man enough for the job. 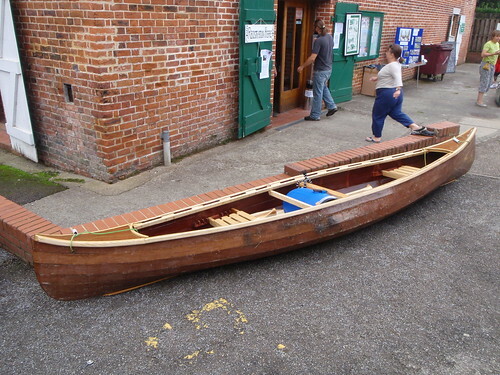 I know what you mean about outriggers, but it is my intention eventually to get this canoe out to sea (albeit close to shore) to get round to Deben and Walton backwaters and to have them will be reassuring in these choppier waters. 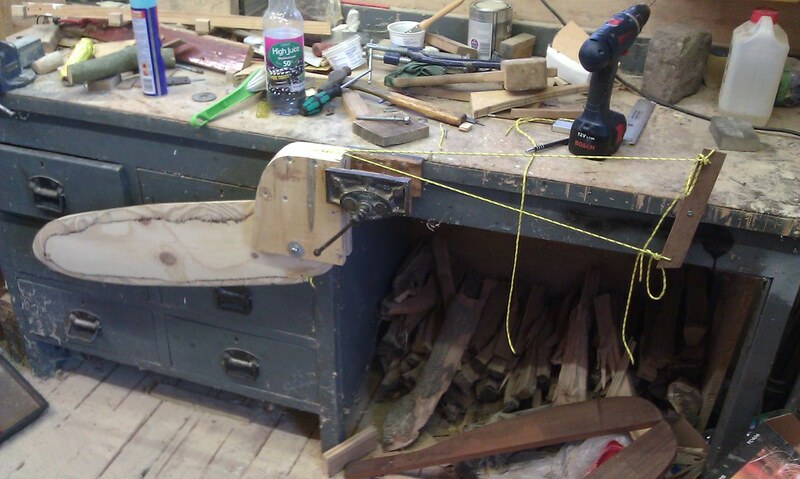 My brother has a well equipped joinery shop so anything made of wood is free or very cheap for me to make! 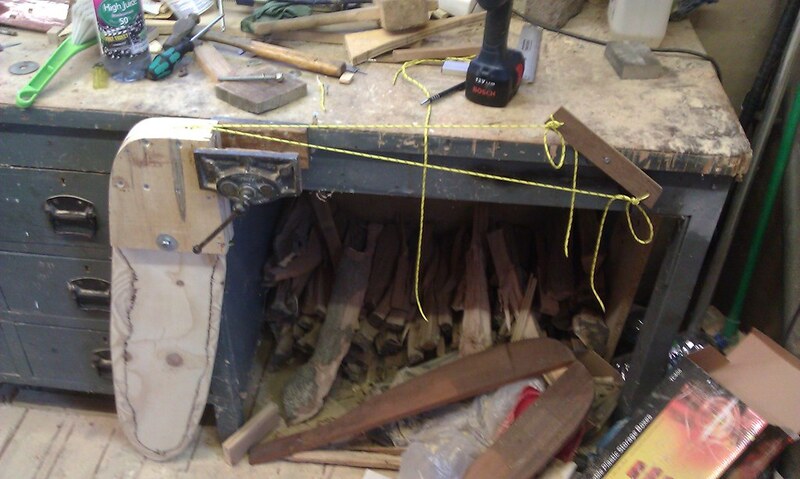 Just need to construct a steamer to bend the ash outrigger beams now. I'm sure our paths will cross in the future, look forward to meeting you at a meet. Edit: forgot to say, stirrup length as pictured worked really well for me. 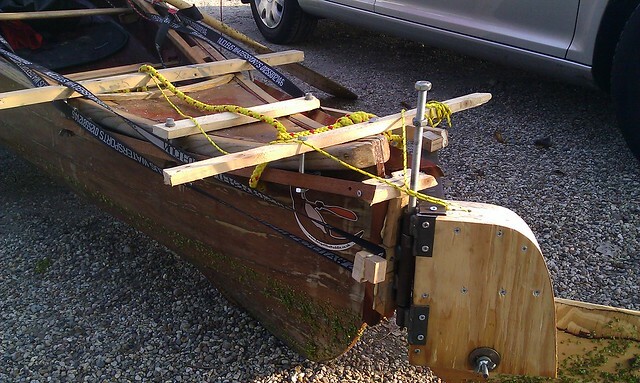 Its main function is to get the boat (with sail and mast attached) upright. 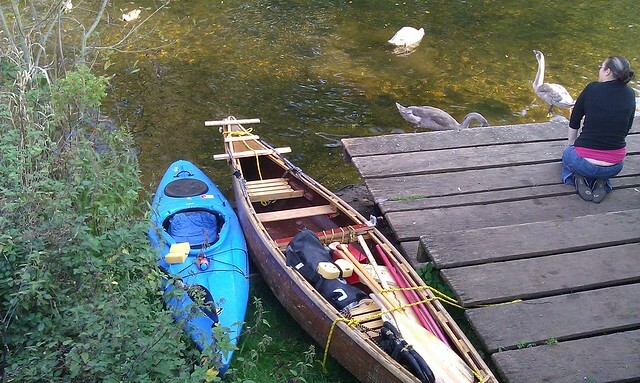 My canoe has a lot of flotation so from there its easy to get back in canoe without using the stirrup. Having said that I might experiment with a second loop higher up to use for getting back in boat. Last edited by fredster; 6th-October-2011 at 07:37 AM. Using just screws (even with good glue like you have) to attach the leeboard angle bracket to the thwart is a risk in my opinion. There's so much force involved as mentioned, especially on the "wrong" tack. I would be inclined to use countersunk head bolts (technically called machine screws) with the nuts on top of a bigger bracket. What is best to varnish it with? Last edited by joe.ford; 6th-October-2011 at 03:01 PM. It's going to seem as if I'm picking out Gailainne here (I'm not doing) but he had that very thing happen to him. He bought the Solway Dory leeboard bracket to replace the "plasticine" (alloy) bracket that I mentioned failing above. He attached it (the new SD bracket) to his leeboard thwart with four big countersunk stainless screws but all four of them ripped out at the OCSG Ullswater Classic meet. This resulted in his leeboard falling off when we were trying to sail down the lake and we had to abandon the trip to go back and fix it. Luckily I had some stainless M6 nuts and bolts with me so we drilled through the screw holes and put the bolts through instead. It's been fine since then. I'll post a pic of the SD bracket to let you see it in a minute. Oh no, it's definitely going to seem like I'm picking on Gailainne now because..............................he made a leeboard from ply, sheathed with mat and epoxy and that broke at OCSG Loch Ken meet (admittedly in very strong gusty winds). I think it was due to an unseen void in the ply causing a structural weakness. He'd tell you all these things himself but he's not been on SOTP much recently (he's been busy building a McGregor sailing canoe but I'm sure that'll be built like a Dreadnought! ) Not saying your leeboard will break as well joe, he was probably just unlucky. You can see details of Gailainne's original set up here (including the plasticine leeboard bracket and the leeboard that broke). He's now using a 44sq ft SD Bermudan rig, SD leeboard and bracket on his original thwart and his original rudder set up (that's not shown on this thread) that works beautifully. he made a leeboard from ply, sheathed with mat and epoxy and that broke at OCSG Loch Ken meet (admittedly in very strong gusty winds). I think it was due to an unseen void in the ply causing a structural weakness. He'd tell you all these things himself but he's not been on SOTP much recently (he's been busy building a McGregor sailing canoe but I'm sure that'll be built like a Dreadnought! ) Not saying your leeboard will break as well joe, he was probably just unlucky. Last edited by joe.ford; 6th-October-2011 at 03:34 PM. I've decided I don't want the triangle sail (I think) Quite like the look of a lugsail. Would quite like something the same size as freds, so when (If) I get good I'm not left too far behind. Going upwind and down. Here's some pictures of my SD leeboard bracket. I hope they don't mind me showing you (I'm sure they won't). Of course you could just give Solway Dory a phone and buy one of their brackets so that you know it won't fail. They sell them separately from the thwart at a very reasonable price. It sounds like the 44sq ft SD Lugsail is what you need Joe. I have the 35sq ft Expedition Rig (High Spec with reefing points) and while it won't perform quite as well as a big Bermudan (triangle) rig it's surprisingly good. I often sail with people who have big Bermudan rigs and they don't have to wait too long for me to catch up. The Expedition Rig is also a bit cheaper than the bigger full spec Lugsail. Probably the best thing would be to go to an OCSG meet so you can look at all the different types of sails and chat to people about the pros and cons of their set ups (they're also great fun to go to as well). 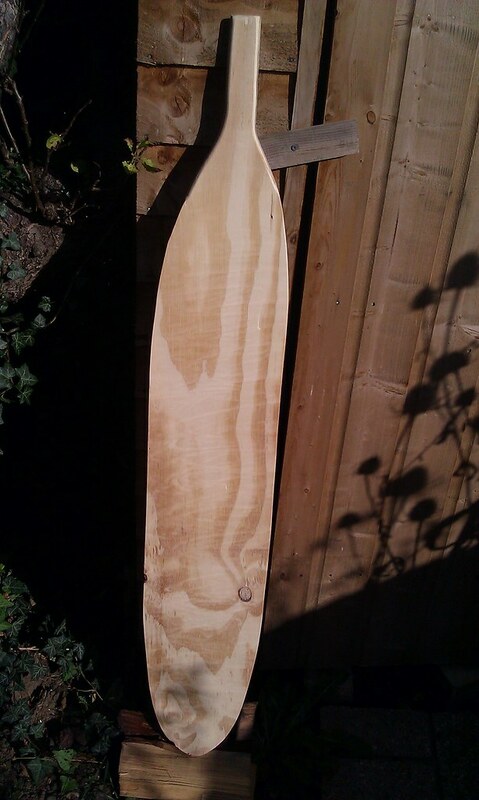 Nice work Joe - although I feel duty bound to tell you (as others have told me) that ply is not the best material for lee boards and rudders as half the grain is going in a direction that offers no strength. Having said that, thats what mine are made of as you know so at least we'll both be limited to milder conditions to learn in. I'm going to pester my chippy mate with a Makita planer to help me aero-section some hardwood planks for rudder and boards soon, the thought of all that planing by hand just doesn't bear thinking about. 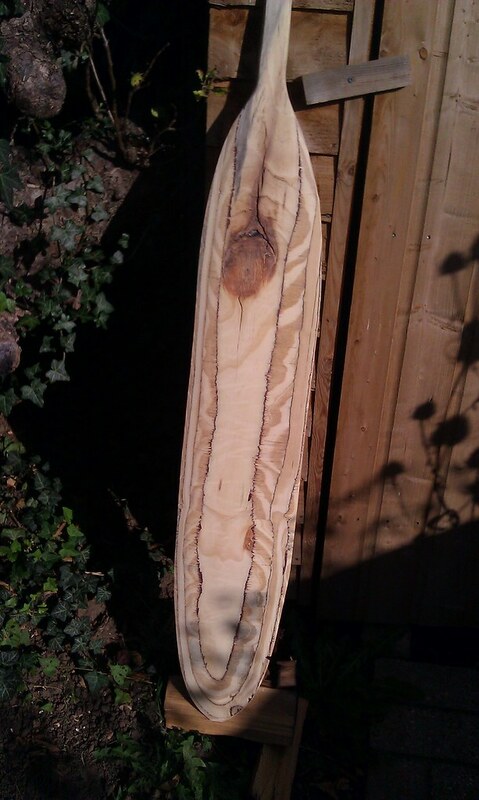 I've done an ash paddle that way, 'twas exhausting and removed only a fraction of the wood that would have to be shifted from rudder and lee board planks. Thats a good tip Keith cheers, will get it done before next sailing. Also a good tip! Money very tight at the mo though so I'm going along the path of bigger brackets in heavy gauge steel, attached as Keith suggests. I'll also reinforce brackets with a triangular piece of steel welded at each end and post some pics on here when done. I'll also reinforce brackets with a triangular piece of steel welded at each end and post some pics on here when done. That sounds like it'd be strong enough, the triangular pieces would eliminate flex which may otherwise cause the bracket to fail. Here we are then. Beefed them up, attached with g-flex and machine screws and made them longer and larger so thwart clamp goes through bracket and more area of bracket against lee board. Should do the job I hope. That looks a lot stronger. Should do the job nicely. Maybe next year we can have a South East row/paddle/sail meet. Herne Bay to Harty Ferry with the tide,a meal at the Ferry Inn on Sheppey and back on the ebb springs to mind.Or maybe you've some places on the other side for something similar? There has been so much good advice from Dave S on these threads.The only problem I have found is that one has to open another window to type in the Solway Dory address. Maybe Dave S could could have the SD address as his tag line so one could simply click and look at the SD products and adventure sailing blogs. Far be it for me to speak for Dave S but I think that he likes to keep a small degree of separation between his SOTP persona and Solway Dory for fear of being seen as pushing SD products on here. I think he prefers to let the products themselves do the talking and rely on satisfied customers to sing their praises. Dave S (and Dave and Jan P) are true canoe sailing enthusiasts in my experience and whilst they are obviously in business to make a living they're passionate about canoe sailing. Hence Dave is happy to give advice and share his vast experience even when it is unlikely to result in a sale. I don't have any connection with SD other than using their products (and I've been very impressed with everything I've bought from them). I've also had loads of advice and assistance from them (as have many canoe sailors). ...Maybe next year we can have a South East row/paddle/sail meet. Herne Bay to Harty Ferry with the tide,a meal at the Ferry Inn on Sheppey and back on the ebb springs to mind.Or maybe you've some places on the other side for something similar? Deffo up for a sailing/paddling meet Andre - think there's a few canoe sailors in the south east that might be keen to join in. ...and agree with you on Dave S and the Solway Dory thing. Sooner or later I'll end up doing it properly and buying some of they're kit, but for now money's tight so its DIY time. Fun way to learn really! But on the plus side, the leeboard has now been finished and varnished. Nice thread, sometimes you learn by trying things, and seeing what works and what doesn't, some people just like to buy ready made, part of the fun for me of trying something new is putting my mind to work to solve problems and making things. With the stuff I made, I had failures and successes, the leeboard bracket, ply leeboard, were failures, basically not understanding the forces involved, not the steady forces, but the ones created by wind gusts, especially after doubling the sail area to a 44 sq ft bermudan after my little balanced lug. With the leeboard bracket I had 2 failures, the first was using a grade of aluminium that was too soft for the bracket. After buying a SD brkt he 2nd was using screws that tore out because water had gotten in and weakened the wood, so screws either need to be countersunk and sealed or replaced by bolts and nuts. The ply leeboard, was as Chris suggested probably a void in the ply, (it was exterior grade not marine grade). a layer of fiberglass would have been ample to make it strong enough, but truthfully the beauty and function of one of the Daves solid ash leeboards is worth every penny. BTW I still enjoyed figuring out a naca airfoil section and designing and building a jig that would allow me to accurately cut that section into a ply board 18 mm thk by 250mm wide by 1m lg. a layer of fiberglass would have been ample to make it strong enough, but truthfully the beauty and function of one of the Daves solid ash leeboards is worth every penny. BTW I still enjoyed figuring out a naca airfoil section and designing and building a jig that would allow me to accurately cut that section into a ply board 18 mm thk by 250mm wide by 1m lg. I think it is great that people have a go at making things themselves. That is how i started out canoe sailing , and indeed i am still doing it now. My best advice though would be to spend lots of time doing research first and search the forums etc for what has worked well and more importantly, what has failed. People who are starting out on a low budget often waste a lot of time and money re-inventing the same mistakes that others have made and often make several attempts at getting it right when spending a bit more time on research and planning would get there more quickly and more cheaply. 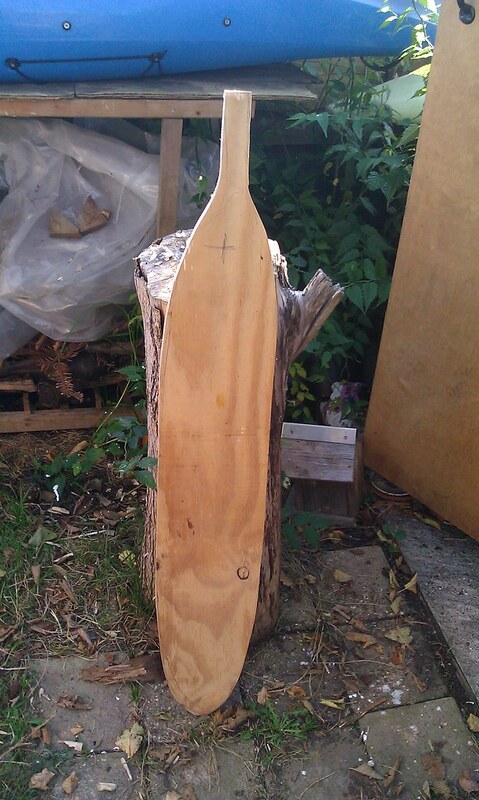 Just a thought, does anyone know if small leaf lime would be a suitable wood for a leeboard / rudder? Did you go for plywood in the end then? At the moment I'm looking at using ply for the prototypes . How do you know where to put the mast foot and thwart? Joe, I am sure more experienced folk will come along to give better advice, but to my mind I would consider sailing your canoe backwards so that you are sitting on the front seat and then fit the mast thwart & mast foot just behind the back seat. (Which would now be the forward seat when sailing) Unfortunately, this might then be in the way when you want to go paddling again, so using bolts with wingnuts to secure the mast thwart would be an option! Essentially your leeboard wants to be at the widest part of the canoe and your leeboard wants to be in line (Or just behind) the centre of effort of the sail. Just google how to measure the centre of effort on your sail as different sail types have different ways of measuring. Mine worked out at being 18-inches to 2-feet forward of my centre yoke/ leeboard. Getting this bit right will determine how manoeuvrable your canoe sails, so worth spending some time calculating the right position. Hope this helps a little? Sail currently down and no rudder attached, just the bracket attached to the gunnels. 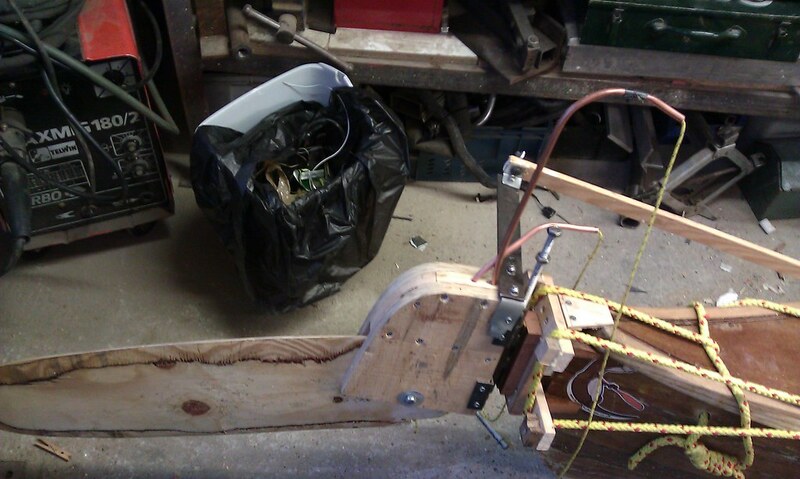 And finally the new clamp and rudder. After solving a minor technical issue, everything worked very well. Why don't we use rudders more often? Very useful when paddling into a head wind . Looks good Joe. Your Clip-on rudder looks simple to strap into place. Do you have a tiller/ push-pull tiller somewhere? I can't see how you would operate the rudder while sailing. I've got the standard pushpull tiller(hidden on the right hand side). I did it the classic way of "that looks long enough". Then found it was a tad too short . Sounds familiar. 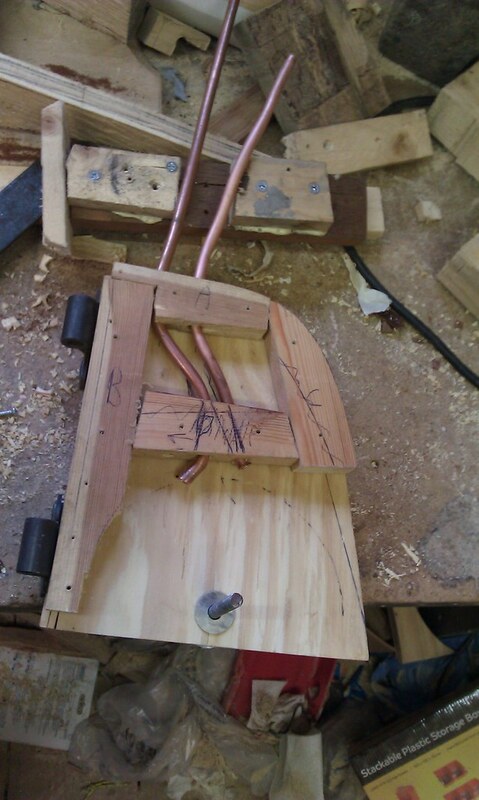 I had difficulties initially with my traditional tiller fouling on the sheet, which was tied to my rear seat. Later I developed a steel frame that allows my tiller to pass under, while the sheet bridle is tied above. Now works a treat. I noticed you braced your mast foot diagonally against the underside of the thwart. In the same manner, would it be possible to fit a brace between the top of the dutch board handle and a second swivel mounted in the middle of the board thwart? This would take considerable load off the single pivot you are using at present. If my description doesnt make sense, please say so and I will attampt a drawing. Your sailing rig looks great to me. I'm very envious. I think most yachts and dinghys would have the mast and lee board set more forward, particularly as you don't have a jib to balance the rig. It might be worth experimenting a little. If the balance is right, when you leave go of the main sheet and the rudder the boat should gradually turn up to be head to wind. I've sailed into Walton Backwaters and the River Deben many times. At low tide you can usually watch the seals on the way in to the Backwatwers and there's a nice beach just inside the entrance on the port side. The Deben entrance can be quite tricky with fast tides. Best to keep away if there's an Easterly wind. Been fiddling with the canoe again. I've got my flotation sorted, I've gone for the Fredster special. The exercise ball a whole £6.99 each from Argos. Have to glue in the straps yet. Also now on the Mk2 clamp. didn't like the old set up, it was too fiddly to get on and off. New method. I think that your buoyancy, whilst being inexpensive, might not work well enough in a capsize. If you are sailing and you capsize a long way from the shore, you really need to be able to re-enter the canoe and still be able to bail the water out. Your canoe, whilst not sinking, will come up full to the gunwales and will be probably not be bailable. The standard minimum used in the OCSG is fore and aft bags AND side buoyancy. Correctly positioned buoyancy in a sailing canoe is the biggest factor in safety and not something to save a few quid on. I am not allowed to sell a sailing canoe unless it passes tests that prove it can be righted, re-entered AND bailed dry. I use two polythene lids from ice cream tubs (not the white ones, the semi transparent ones), and cut two 4" washers from them. These stop the rudder sticking in the stock when it gets wet. Im geting a lot of engoyment from reading this thred, I love making my own gear to, so much that I started doing it comershaly . I have a little question about the rudder. How good a fit should it be in the stock? It appears I made it a very good fit. It seems to move ok when I grab the end and move it, especially being as it's about 3 ft from the pivot point and has more leverage behind it. And lastly, does anybody know if epoxy resin sticks to royalex? Agreed. Amazing stuff. £35 a go but if you consider how much that quantity of Araldite would cost its not too dear. I was hoping to use the epoxy that is left over from building the canoe. I suspect that you'd encounter problems when you sailed in any kind of stronger winds Joe and if the mast foot comes unstuck you could be looking at damage to the mast thwart and potentially the mast coming out and punching through the bottom of your canoe. The G-Flex is a lot to pay for one installation though it's true. Maybe Fred can help you out with some G-Flex? It has a shelf life so there's no point in hording it, failing that I'll see if I can find some small bottles and decant some of mine if you want?